As the fourth industrial revolution takes the world by storm, many government agencies and private players want to know how the potential of Artificial Intelligence can be best harnessed. 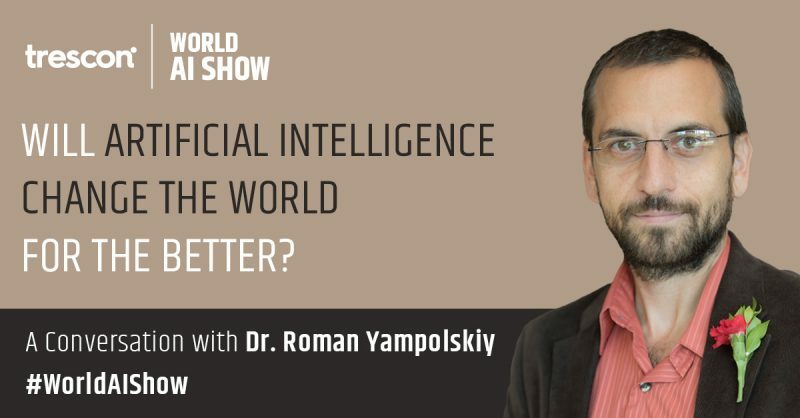 Trescon recently interviewed Roman Yamploskiy, computer scientist, and speaker at Wold AI Show taking place on 16-17 April 2018 in Dubai, UAE, gives his opinion on the progress humanity has made in AI and on the new field of science known as ‘Intellectology’. Roman Yampolskiy is currently a Professor at the University of Louisville. ‘Intellectology’ is one of the most interesting ideas from your book ‘Artificial Superintelligence: A Futuristic Approach’. Can you please explain a bit on that? Intellectology is a field of science which looks to study and classify design space of intelligent agents and work on establishing limits to intelligence (minimum sufficient for general intelligence and maximum subject to physical limits). In addition to that, it looks to contribute to the consistent measurement of intelligence across intelligent agents, look at recursive self-improving systems, design new intelligence (making AI a sub-field of intellectology) and evaluate capacity for understanding higher-level intelligence by lower level ones. The field is not subject to the current limitations brought on by the human-centric view of intelligence and will open our understanding to seeing intelligence as a fundamental resource like space or time. In the context of complexity analysis of emerging AI that is seen as an ‘existential threat to humanity’, what can be the most plausible fail-safe options? A number of solutions have been suggested, including confinement that involves isolating the rogue AI from the mainframe systems until it is contained and eliminated. The off-switches, which basically means to pull the plug and thus shut the whole system in the process and corrigibility. But due to the rapidly evolving nature of AI, they are unlikely to work in all cases and thus research on AI Safety continues. Is there any progress on AI safety so far? We are making excellent progress and research is accelerating. From driverless cars to financial transactions, AI is transforming the everyday human life like never before. In your opinion, what can be the top 5 challenges AI will face in today’s world? I’d say biased data, limited computational power, adversarial users, value misalignment, and lack of understanding. According to you, what are the top 10 industry sectors that AI will impact the most? I’d say the automobile, healthcare, science, accounting, blockchain, cybersecurity, finance, entertainment, manufacturing, and service. What can be the driving force behind businesses adopting AI solutions? Businesses are always on the lookout to cut down on costs in order to bring their profits up. AI can offer many avenues with which they can achieve their sales targets. Aside from increasing productivity and efficiency, one of the top driving factors to adopting AI in businesses will be the costs savings from free labor, the efficiency and boost in productivity will come a bit later. As a speaker, what are your expectations from the upcoming World AI Show? I look forward to meeting amazing people and learning inspiring new ideas from the event.